What's the risk of capital flight in China? I wrote before that the likely negative surprise was going to come from China and not Europe (see Focus on China, not Europe). Yes, I am worried about China, but my concerns are longer term oriented. In the context of complicated and changed economic situations, the Chinese government has vowed to make some tailored changes to its established macroeconomic policy. At an earlier State Council meeting, a consensus was reached that China will accelerate the approval of some infrastructure projects, promote consumption of energy-saving home appliances and increase tax cuts on enterprises in a bid to ensure steady growth. China's central bank also announced a 50-basis-point cut for banks' reserve requirements on May 12, the second such cut this year and a third since December, which will release more liquidity. The stimulus packages are expected to reach 1 trillion yuan ($158 billion). The markets then sold off the next day when it realized that the size of the program is only one-quarter of the size of the 2008 RMB 4 trillion program. What did you expect? They announced that it would by RMB 1 trillion! Is China's business elite losing confidence in China? Here's what I am worried about: There are signs that the Chinese business elite is losing confidence in China, which could result in a disastrous run on the RMB. And on that note, we found some of the points raised in this 2011 paper by Victor Shih from Northwestern University extremely insightful. For one thing, did you know that China’s wealthiest 1 per cent could determine everything? China in fact faces three major structural causes of capital flight. First, the empirical portion of this paper will conduct three calculations to show that the wealthiest 1% households in China commands wealth that is at least as large as 2/3 of the foreign exchange reserve and possibly as high as nearly twice its size. Thus, if the top 2.1 million households in a nation of 1.3 billion people decide to move even 30% of their wealth overseas, the foreign exchange reserve will reduce by a trillion dollars or more. Second, despite official foreign exchange control, numerous channels, especially those through China’s current account, exist to move capital in and out of China. Third, households, which are net savers, face a negative 3 plus percent in real return from bank deposits and Chinese treasury bonds, forcing them to constantly look for higher returns than inflation rates. These three conditions combine to create extremely fragile conditions for China’s foreign exchange reserve, which is the backbone of the entire financial system of China. If the foreign exchange reserve is depleted by capital flight, the central bank will need to resume large scale money creation, as it did in the 1980s and the 1990s, to maintain the solvency of the banking sector (Walter and Howie 2011; Shih 2004). In other words, the Shih paper says that China's foreign exchange are highly vulnerable to a loss of confidence by its business elite. So what? That's just like saying that a banking system, any banking system, is vulnerable to a loss of confidence. What if all the depositors all rushed to get their money out of the banks at the same time? If you had been predicting doom in the banking system in the last 50 years based on this premise, you would still be waiting for the collapse to occur. FT Alphaville highlighted a survey by the Committee of 100, an international, non-profit, non-partisan membership organization that brings a Chinese American perspective to issues concerning Asian Americans and U.S.-China relations. The results of this key question asks American and Chinese business leaders their outlook for China. While Americans believe that Chinese growth will continue long into the future, the Chinese are far less optimistic and their outlook has deteriorated rapidly since 2007. OK - so they are starting to lose confidence in China's long-term growth outlook. What are they doing about it? 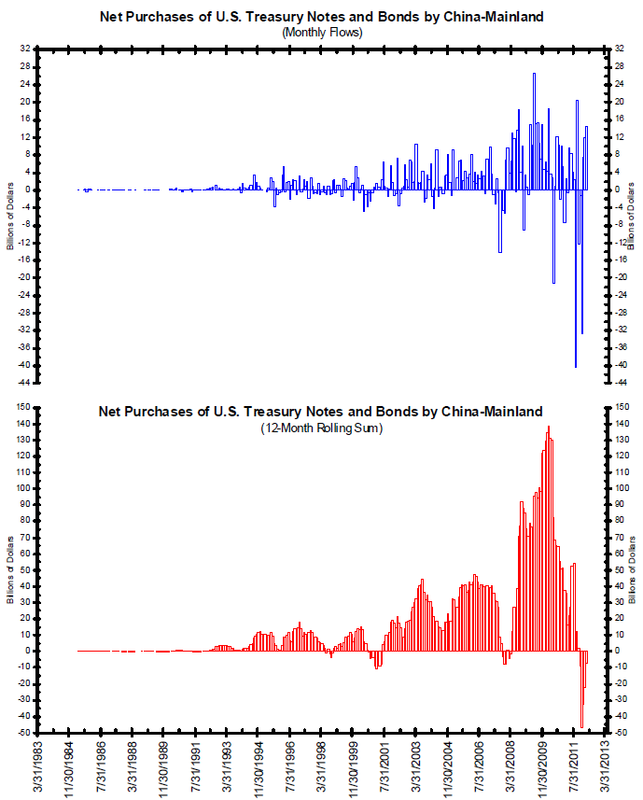 Look at this chart from Bianco Research of China's net purchase of Treasuries. They went NEGATIVE a few months ago and ticked back to positive, but net purchases are still net negative on a rolling 12 month basis. We noted last week that there was a rising tussle over dollars in China, spurred by capital outflows and RMB-denominated selling on signs that the world’s key economic powerhouse may be slowing. A situation which was arguably thrusting China into a dollar short position. While that might seem counterintuitive given China’s substantial longer-duration dollar assets, it is possible because of China’s substantial short-term dollar liabilities. Essentially, we’re talking about a dollar-denominated duration mismatch on the mainland at a time when China is running one of its largest outstanding external debt positions for 27 years. When I worked with our emerging market investment team, the team head told me that one of the buy signals for a country is when the locals start to repatriate funds from abroad (and he was referring to Latin America at the time). 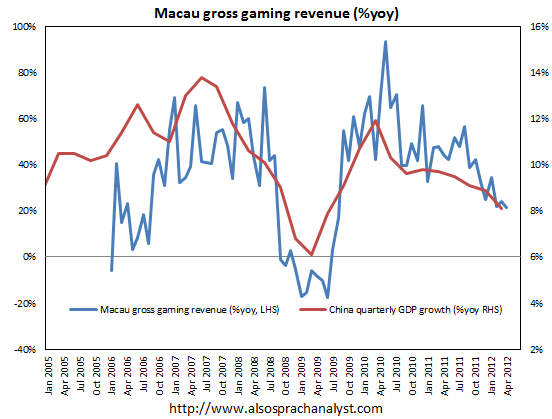 What we have in China are signs of a loss of confidence, followed by indications of capital flight - all very bad news. To be sure, I may have just misinterpreted the data and wrongly concluded that capital flight is occurring. Another explanation is that this episode of capital flight is just a momentary flash of panic, created by the uncertainty that accompanies a change in leadership. 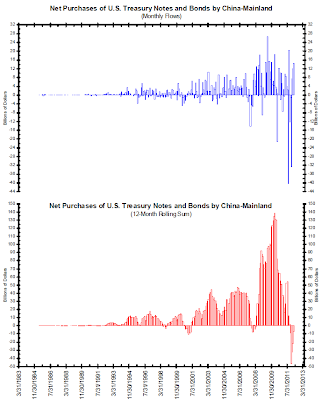 Let me make myself clear: A collapse in China's foreign exchange account is not my base case scenario. Such a loss of confidence would not just mean a hard landing involving sub-par economic growth, but a crash landing involving negative GDP growth, which would totally freak out the markets. Nevertheless, the probability of such an event is small, but non-zero - and definitely not discounted by the markets at all. What worries me is that the markets start to get a whiff of this story and starts to price in this kind of tail risk. That's when the trouble begins. Cam Hui is a portfolio manager at Qwest Investment Fund Management Ltd. ("Qwest"). This article is prepared by Mr. Hui as an outside business activity. As such, Qwest does not review or approve materials presented herein. The opinions and any recommendations expressed in this blog are those of the author and do not reflect the opinions or recommendations of Qwest. None of the information or opinions expressed in this blog constitutes a solicitation for the purchase or sale of any security or other instrument. Nothing in this article constitutes investment advice and any recommendations that may be contained herein have not been based upon a consideration of the investment objectives, financial situation or particular needs of any specific recipient. Any purchase or sale activity in any securities or other instrument should be based upon your own analysis and conclusions. Past performance is not indicative of future results. Either Qwest or Mr. Hui may hold or control long or short positions in the securities or instruments mentioned. For American investors, Friday will be the big data day which features the Non-Farm Payroll release. The last two NFP numbers have been below expectations. Looking ahead to Friday, however, I think that it is likely to come in either in-line or slightly above consensus expectations for a couple of reasons. First, the Citigroup Surprise Index, which measures high-frequency economic numbers, is steadying after falling below the zero line, which indicates more negative than positive surprises. The rate of deterioration has been halted, which is mildly positive for the economic outlook. In addition, Gallup does an employment tracking poll and Gallup forecasts a slight downtick in the unemployment figure in May. I hate NFP days, because the number is so volatile and the error term is so large. In the last two months, I would have taken the "under" expectations bet if someone put a gun to my head and forced me to make a forecast. This month, I am taking the "over" because I am expecting a slight beat (by 10K or less). Will good news really be good news? Bottom Line: The data flow is soft, but Dudley indicates it is not soft enough to ease. And while some are pointing to falling TIPS-derived inflation as given the Fed room to move, they have traditionally delayed until conditions are more dire (they are not exactly prone to overshooting in the first place). The Fed doesn't think they will ease further; they think their next move will be to tighten. Which means that financial conditions will need to deteriorate dramatically to prompt action in June. So if you are looking for the Fed to ease in just four weeks, you are looking for financial markets to turn very, very ugly. Lehman ugly. And I wish that I could say that it won't happen, but European policymakers are hell-bent to push their economies to the wall while worshipping at the alter of moral hazard. The Bernanke Put may still live, but the deductible on that insurance will be a lot higher for the remainder of 2012. While everyone is focused and worried about the news flow from Europe, I am less concerned about the prospects for Greece and the eurozone. As I wrote in my last post (see Draghi, the last domino, falls), Germany is becoming increasingly isolated and expect her to start to bend on the issue of eurobonds. While they may not be eurobonds in the strictest sense, we are likely to see some sort of typical European compromise on Pan-European infrastructure bonds. I am more concerned about the news flow out of China, which is likely to deteriorate over the next few months - and none of the negative news has been discounted by the market. Chinese Premier Wen Jiabao said the government will focus more on bolstering economic growth, indicating policies may be loosened further as inflation moderates. “The country should properly handle the relationship between maintaining growth, adjusting economic structures and managing inflationary expectations,” Wen said during a tour of Wuhan, the capital of China’s Hubei province, from Friday to Sunday. “We should continue to implement a proactive fiscal policy and a prudent monetary policy, while giving more priority to maintaining growth,” Wen said. Wen’s remarks cited in the report, which didn’t mention concern about inflation, indicate the government might take more aggressive steps to support the economy after April data showed the slowdown may be sharper than expected. The central bank this month cut banks’ reserve requirement ratio for the third time since November to boost liquidity. Take a look at the Shanghai Composite, which reflects this ambiguity about China's near-term growth outlook. The index is currently testing the downside of an unresolved wedge formation, which indicates indecision. A breakout to the upside of the wedge would be interpreted bullishly while a downside breakdown would be bearish. While the picture of the Shanghai Composite reflects this consensus view, a tour of secondary market indicators suggest that not all is well with the Chinese economy. First of all, the flash PMI release showed contraction. 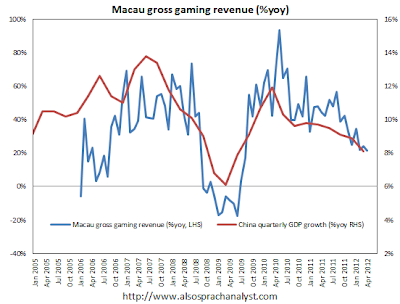 Signs of economic weakness are everywhere, this analysis shows a a tight correlation between Macau gaming revenues and Chinese growth - and gaming revenues are falling. Next door in Hong Kong, the Hang Seng Index is not behaving quite as well as the Shanghai Composite. The index rallied in February to fill the downside gap that occurred in August 2011, but the rally couldn't overcome resistance. The index has now violated an important support zone and weakening rapidly. Further north from Hong Kong, South Korea is an economy that is highly sensitive to global economic cycle. In particular, the South Koreans export a lot of capital equipment and other goods to China. That country's stock market isn't behaving well either. In fact, it's cratering. China has been an enormous consumer of commodities. Commodity prices have also been weakening as the CRB Index is in a downtrend and has violated an important support level. Australia is not only a major commodity exporter, it is highly sensitive to Chinese commodity demand because of its geography. The AUDUSD exchange rate is falling rapidly. Just to show how bad things are, the Canadian economy is similar in characteristic to Australia's. Both are industrialized countries that are large commodity exporters. The only difference is that Australia is more levered to China, whereas Canada is more sensitive to US growth. Take a look at the AUDCAD cross rate as a measure of the forward expectations between the level of change in Chinese and American growth. Is the shadow banking system unraveling? There really are two related but distinct things people have in mind when they talk about a “hard landing” for China. The first is a rapid deceleration of GDP growth – below, say, 7%. The second is some kind of financial crisis. I think we’re already seeing some signs of the first, and the second is a bigger risk than most people appreciate. In early April, Caixin magazine ran an article titled “Fool’s Gold Behind Beijing Loan Guarantees”, which documented the silent implosion of Zhongdan Investment Credit Guarantee Co. Ltd., based in China’s capital. “What’s a credit guarantee company?” you might ask — and ask you should, because these companies and the risks they potentially pose are one of the least understood aspects of China’s “shadow banking” system. If the risky trust products and wealth funds that Caixin documented last July are China’s equivalent to CDOs, then credit guarantee companies are China’s version of AIG. As I understand it, credit guarantee companies were originally created to help Small and Medium Enterprises (SMEs) get access to bank loans. State-run banks are often reluctant to lend to private companies that do not have the hard assets (such as land) or implicit government backing that State-Owned Enterprises (SOEs) enjoy. Local governments encouraged the formation of a new kind of financial entity, which would charge prospective borrowers a fee and, in exchange, serve as a guarantor to the bank, pledging to pay for any losses in the event of a default. Having transferred the risk onto someone else’s shoulders, the bank could rest easy and issue the loan (which it otherwise would have been reluctant to make). In effect, the “credit guarantee” company had sold insurance — otherwise known as a credit default swap (CDS) — to the bank for a risky loan, with the borrower forking over the premium. Under the arrangement, a participating company would take out a bank loan and give some of the money to Zhongdan for investing in high interest-paying wealth management products for a month or more. The firm then apparently put those funds to work by buying stakes in small companies such as pawnshops and investment consulting firms, according to the sources. Some of the funds went toward a U.S. consultancy that later failed. When excesses occurred in the US with subprime lending and "liar loans", rules were skirted. It's no different in China. To nail one loan, [an executive for a building materials manufacturer] said, Zhongdan formed a shell building materials supplier and wrote a fake contract between the supplier and his company. The document was presented to the bank, which approved the loan. Zhongdan later de-registered the phony supplier. It all unraveled in the end. Several banks that cooperated with Zhongdan smelled trouble and started calling loans they had issued to companies backed by the firm … The next domino fell when the creditor companies, seeking to appease the banks, turned to Zhongdan for help repaying the called loans. But Zhongdan executives balked, and the domino effect accelerated as companies teetered under bank pressure and the city’s business community shuddered with credit freeze fears. When I hear stories like this, I think of the cockroach theory. If you see one cockroach, there are sure to be more. Reuters recently reported a story that Chinese buyers were defaulting on coal and iron ore shipments. While this story may be an indication of a slowing economy in China and slackening commodity demand, it might have stopped there. But the story gets worse as it exposes the cracks in the shadow banking system. It turns out that Chinese buyers have been buying commodities and using them as collateral to obtain financing. When the economy and commodity prices turned down, they were caught. This type of financing is highly prevalent in the copper market, as Reuters reported that Chinese warehouse were so full that copper inventory was the red metal was being stored in car parks. I have no idea what all this means. China's economy is highly opaque and we have no reliable statistics. How big is the shadow banking system and how much leverage is involved? We know that there are problems, but I have no way of quantifying it. Could this result in a crash landing, i.e. negative GDP growth, in China? I have no idea. Certainly, the unraveling of excessive leverage has seen that kind of result before. Here is one offbeat way that I am watching for signs of stress in China's shadow banking system. I am watching the share price of HSBC. While HSBC is a global bank, it has deep roots in Hong Kong and Asia. For newbies, HSBC stands for Hongkong Shanghai Banking Company. It is a bank that was firmly established in Hong Kong. 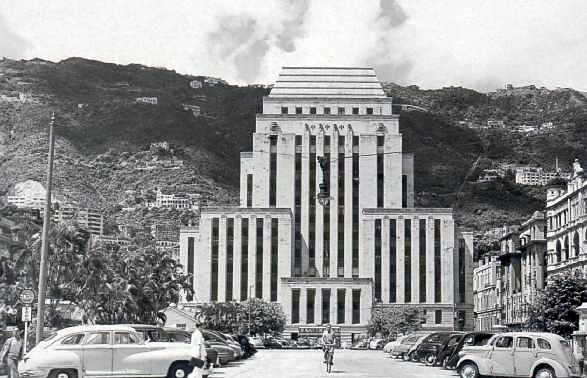 As a child, I can remember driving by the bank's headquarters in downtown Hong Kong in the 1960's. Stresses in the Chinese financial system is likely to show up in the share price of major financials that have exposure to China and Asia, like HSBC. The stock has been falling rapidly in the past couple of weeks, which is not a good sign. To put the stock performance into context, I charted the performance of the stock relative to the BKX, or the index of US bank stocks. HSBC has been in a relative downtrend, but the lows of 2009 have not been violated. I interpret this as the market signaling that while there may be signs of trouble, it is not panicking. To add to China's troubles, the Chinese business elite is starting to lose confidence in China's long-term outlook. FT Alphaville highlighted a survey by the Committee of 100, an international, non-profit, non-partisan membership organization that brings a Chinese American perspective to issues concerning Asian Americans and U.S.-China relations. The results of this key question asks American and Chinese business leaders their outlook for China. While Americans believe that Chinese growth will continue long into the future, the Chinese are far less optimistic and their outlook has deteriorated rapidly since 2007. Putting it all together, we have signs of a weakening economy, a shadow banking system that is teetering and a loss of confidence by China's business elite. While the government is taking steps to address the problems, none of these risks have been discounted by the market. While I expect the news flow from Europe to improve in the days to come, which is bullish, I also expect further stories of deterioration out of China, which has the potential to be extremely bearish. All this points to further choppiness in stocks and risky assets with a downward bias. So when she studies the Greek balance sheet and demands measures she knows may mean women won't have access to a midwife when they give birth, and patients won't get life-saving drugs, and the elderly will die alone for lack of care – does she block all of that out and just look at the sums? "No, I think more of the little kids from a school in a little village in Niger who get teaching two hours a day, sharing one chair for three of them, and who are very keen to get an education. I have them in my mind all the time. Because I think they need even more help than the people in Athens." She breaks off for a pointedly meaningful pause, before leaning forward. "Do you know what? As far as Athens is concerned, I also think about all those people who are trying to escape tax all the time. All these people in Greece who are trying to escape tax." Even more than she thinks about all those now struggling to survive without jobs or public services? "I think of them equally. And I think they should also help themselves collectively." How? "By all paying their tax. Yeah." International Monetary Fund head Christine Lagarde Tuesday called on euro-zone governments to accept more common liability for each other's debts, saying that the region urgently needs to take further steps to contain the crisis. "We consider that more needs to be done, particularly by way of fiscal liability-sharing, and there are multiple ways to do that," Lagarde told a press conference in London to mark the completion of a regular review of U.K. finances. I wrote last week (see A Canadian's roadmap to Greek struggles) that to expect Europe to show both a carrot and a stick to the Greeks. Lagarde offered them a carrot last week in the form of tacit support for eurobonds. Now she is showing them a stick. * I can still recall the Doonesbury cartoon from the 1970's of the Chinese parent admonishing his son to eat his jellied duck web because there are poor starving children in West Virginia. We are living at a critical juncture in the history of the Union. The sovereign debt crisis has exposed serious weaknesses in the institutional framework; in this context, the difficulties in finding common solutions are having a negative impact on market valuations. The extraordinary measures taken by the ECB have gained us time; they have preserved the functioning of monetary policy. But we have now reached a point where European integration, in order to survive, needs a bold leap of political imagination. It is in this sense that I have referred to the need for a “growth compact” alongside the well-known “fiscal compact”. A growth compact rests on three pillars and the most important one, from a structural viewpoint, is political: the economic and financial crisis has challenged the myopic belief that monetary union could remain just that, and not evolve into something closer, more binding, into an arrangement whereby national sovereignty on economic policy is replaced by the Community ruling. If the governments of the Member States of the euro define jointly and irrevocably their vision of what the political and economic construct that supports the single currency will be and what the conditions to reach that goal together should be. This is the most effective answer to the question everyone is asking: “Where will the euro be in ten years’ time?”. Hmm, sounds sort of like an endorsement of eurobonds to me. The second pillar is that of structural reforms, especially, but not only, in the product and labour markets. The completion of the single market and the strengthening of competition are crucial for growth and employment. Labour market reforms that combine flexibility and mobility with a sense of fairness and social inclusion are essential. Growth and fairness are closely connected: without growth, and the events of recent months also reflect this, the temptation to “circle our wagons” gains strength, and solidarity weakens. Without fairness, the economy breaks up into multiple interest groups, no common good emerges as a result of social and economic interaction, and there are negative effects on the capacity to grow. Recent Italian history has no shortage of examples. In the European Union, between 2007 and 2011 the unemployment rate rose by 5.8 percentage points among the 15-24 year olds, by 3.5 points among the 25-34 year olds and by 1.8 points in the 35-64 age range. Qualitatively, the profile is similar almost everywhere; the clear exception is Germany, where the unemployment rate among 15 to 24 year olds in the first quarter of 2012 was 8%; in Italy it was 34.2%, in Spain 50.7% and the euro area average was 21.9%. These trends reflect a fundamental question: they confirm the particular vulnerability of this essential part of our workforce. The unequal sharing of the “cost of flexibility”, only affecting young people, an eternal flexibility with no hope of stabilisation, leads among other things to companies not investing in young people, whose skills and talents often decline in jobs with low added value. The underuse of their resources reduces growth in various ways: it makes the creation of start-ups less likely – and they are on average more innovative than others – it causes a decline in skills in the long run, slowing down the assimilation of new technology and acting as a brake on efficient production processes. In addition to undermining society’s sense of fairness, it is a waste that we cannot afford. The third pillar is the revival of public investment: the use of public resources to push forward investment in infrastructure and human capital, research and innovation at national and European levels. (The proposed strengthening of the EIB and the reprogramming of Union structural funds in favour of less-developed areas go in this direction). An endorsement of closer economic integration? A advocate for pan-European infrastructure bonds, which is the first step in the slippery slope to eurobonds? It sounds like Merkel is losing her last ally in Mario Draghi. Expect the Germans to bend sooner than later. As stocks have descended in the last few weeks, investor sentiment measures have moved into zones indicating excessive fear. 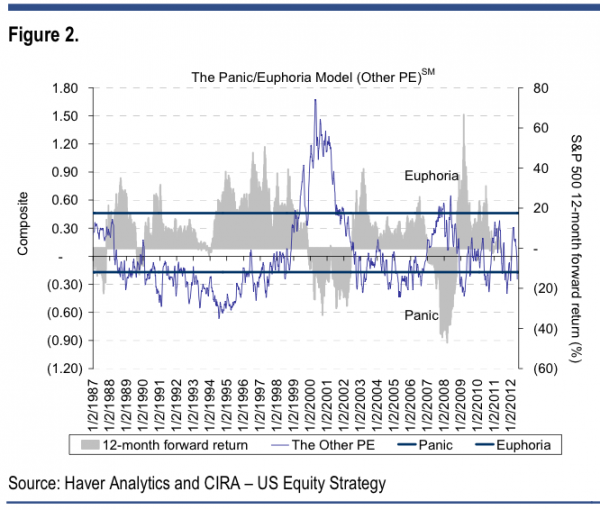 As an example, the Citigroup Panic/Euphoria model is in the "panic" territory, which is contrarian bullish. Numerous other indicators, such as the Ticker Sense Blogger Survey, to which I contribute and voted "bearish" last week, also confirms the observation that there are too many bears. What's bothering me is that while all these sentiment surveys point to excessive bearishness, market based indicators such as the VIX Index is not showing very much fear at all. Remember, what what they do, not what they say. While I have written before that this market is deeply oversold and due for a relief rally, these readings are suggestive that there is more downside before we see an intermediate term bottom. A small state within a federation of states believe it's getting a raw deal. A charismatic leader emerges who tells the population of the small state that he has a solution that relieves them of the burden, but get the benefits of the federation at the same time. Greece? Well, sort of. In Canada, we went through a similar experience with the Quebec sovereigntist movements, culminating in the referendum of 1980 and a second one in 1995. If that is a road map for the political struggles that we see in Greece today, then consider what happened in the Canadian experience. In the Quebec case, the sovereigntist message was, "We can have our own country, our own culture and at the same time have the economic benefits of Canada as well." The reasoning went something like this. If Quebec were to separate, Canada would have no choice but to enter into some sort of economic association with Quebec, as the economies are so intricately connected with each other. Quebec would even use the Canadian Dollar as its currency (a bad idea given the eurozone experience of not having control of your own monetary policy, but they didn't know that then). Canada has always allowed dual citizenship, so Quebec citizens could retain their Canadian citizenship, so what's the big deal? It was a seductive message, just as Syriza's message is today to Greeks. Default, but stay within the euro. What can they do to us? Here's what to expect. From the Canadian federalist (anti-separation) side, there were two messages, one offering a carrot and the other a stick. There was the tough talk about the dire consequences of what happens if Quebec were to leave. You're either in or out. Don't expect a sweet deal, or any deal on economic association if you were to leave. For example, there was some dispute of how much of Canada's national debt Quebec were to assume if it were to become a separate country. I can recall that Diane Francis of the conservative National Post suggesting that Canada should unilaterally separate Government of Canada bonds and notes by a set amount and declare a portion to be Quebec's obligation. You cannot work 35 hours a week, want to retire by 50 with full pension, have eight weeks of holiday and expect to be bailed out by people who work their butts off either in northern Europe or in China. Life does not work like that. German Chancellor Angela Merkel and French President Francois Hollande said they would consider measures to spur economic growth in Greece as long as voters there committed to the austerity demanded to stay in the euro. Notice the carrot and stick in their statements. The Bundesbank, the most hawkish of central banks, has signalled it would accept higher inflation in Germany as part of an economic rebalancing in the eurozone that would boost the international competitiveness of countries worst-hit by the region’s debt crisis. A future German inflation rate above the eurozone average could be part of a natural adjustment process as crisis-hit countries pulled themselves out of recession, the Bundesbank argued in evidence to German parliamentarians submitted on Wednesday. It followed comments at the weekend by Wolfgang Schäuble, German finance minister, backing stronger wage increases, which would boost domestic demand – benefiting other European countries exporting goods and services to Germany – but could drive German inflation rates higher. Despite the Bundesbank’s conciliatory stance on inflation, German policy makers have been among the toughest in insisting that Greece sticks to its agreed reform programme underpinning its bailout in the aftermath of Sunday’s Greek election in which most voters rejected the plan. Speaking in Brussels, Mr Schäuble said that changing the bailout terms would unleash ‘’catastrophic uncertainty’’ in financial markets. In Canada, both Quebec referendums on sovereignty were defeated. The first by a fairly wide margin and the second narrowly by less than 1%. Guessing the likely outcome of the Greek elections is trickier. Athens - The results of the May election are in conflict with the people's desire to stay with the Euro. The people voted in anger. They voted against those they had voted for in the past. Now they see whom they have elected. Every day on TV the extreme right is interviewed. They are Nazi’s. People are frightened by this. On the left you have Alexis Tsipras (Syriza). This man is an uneducated thug. The people understand that. They don’t want this man to be their leader. When the next election comes, Greeks will not vote in anger and they will not vote for the idiots on the fringes. The centrist parties will rebound. A National Salvation Government will be formed. Athens - I don’t think those polls are accurate. To me, things look much brighter today than a few weeks ago. BK - But does it matter who wins? Can Greece be saved? Athens - This up to Germany. Most of the debt is now with Germany and France. France’s Hollande would agree in one minute to reset the interest on the debt to zero for the next five years. If Germany agrees to do the same, there is a chance. The IMF would support Greece under these conditions. The restructured bank debt would get paid interest. 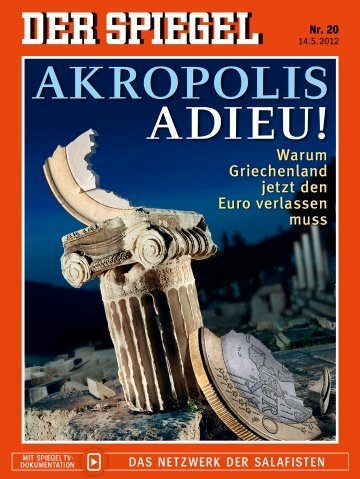 BK - Do you really believe that Greece can achieve a long-term recovery with this? Athens - Not a chance. Everything will blow up again in less than one year. After recent polls put Syriza in the lead, a survey Friday showed the race narrowing, giving New Democracy 23.1 percent of the vote, up from the 18.85 percent it won on May 6, with Syriza on 21 percent, up from 16.8 percent. The Germans are becoming more conciliatory. The pro-European Greek parties are starting to gain ground. Going forward, events will be fluid and volatile, but don't get short and bet on the catastrophic scenario of a Greek exit or even default. Chances are, Europe kicks the can down the road one more time. Last week, my Asset Inflation-Deflation Trend Model flashed a deflation signal, indicating a position of defensiveness portfolios. Out of respect for our clients, I waited a few days before posting the update on my blog here. As regular readers know, the Trend Model relies primarily on commodity prices as the canaries in the coal mine to determine the global growth and inflationary expectations and therefore environment for the risk on/risk off trade. The picture for commodities has been indeed weak. There is also anecdotal evidence that China's real estate market is unraveling. Even here in Vancouver, where we have seen considerable amount of Mainland Chinese money pouring into the residential property market, Vancouver housing is start to look soft. All in all, it's starting to look ugly intermediate term. 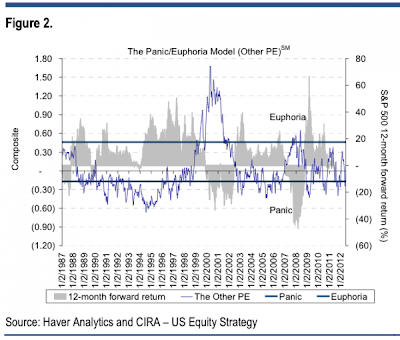 In the short-term, however, stock prices are highly oversold by virtually all measures and sentiment models are at bearish extremes, which is contrarian bullish. My favorite overbought/oversold model is flashing an oversold reading, which should be good for a 1-3 week relief rally soon. For investors who were caught by the sudden downdraft in the price of risky assets, I would suggest that they wait for the inevitable rally and take that opportunity to lighten up their positions to reduce risk. Traders whose missed this move will likely find that it's too late to get short. I am seeing extreme oversold readings across the board, not just in stocks, but in my inter-market analysis such as the chart below of the relative returns of SPY vs IEF. If you get short here, you are liable to get your face ripped off in a counter-trend rally. Looking longer term, I expect that the next few months will be volatile but the markets will have a downward bias. Barry Ritholz pointed out that the ECB is becoming concerned that Europe is becoming like Japan (see ECB: EU Economy Strikingly Similar to 1990s Japan). The ECB appears to be understating the similarities between the weak growth outlook in Japan after its domestic asset bubbles popped in the early 1990s and that for the euro area in the present crisis. The performance of the Japanese economy 20 years ago was better than that of the euro area more recently. The Nikkei 225 peaked at the start of 1990. GDP was 7 percent higher 4.5 years later, according to the IMF’s measure in constant prices. European policy makers have failed to implement some of the reforms that also proved elusive in Japan. The staff economists stated: “The strong emphasis traditionally placed on job security in Japan may have reduced flexibility by hampering sectoral adjustments in the economy.” This time, only one word needs to be changed to describe the euro area. That is “Japan”. The fiscal problems are also comparable. The analysts in Frankfurt said “deteriorating revenues and rising social security spending also contributed to the increase in the fiscal deficit in the early 1990s. To consolidate public finances, the government raised value-added taxes in 1997 with the onset of the Asian crisis, which some observers regard as having postponed the recovery.” Demographic similarities are striking as well. While the diagnosis is interesting, what's more interesting is the study in contrast in proposed response between the Draghi ECB and the Bernanke Fed, which is also concerned about the United States falling into a deflationary trap, to the problem in Japan. Mario Draghi's approach is to pressure member states to address these issues directly by offering an implicit carrot and a stick. The carrot the ECB can offer is easy monetary policy should eurozone governments implement these policies. The stick is that, should member governments stray from the prescribed course, to leave them to the mercy of the bond market vigilantes. On structural reform, which he branded as a "growth compact", he wants governments to implement structural reforms, or what amounts to an internal devaluation in the peripheral eurozone countries (see Draghi's "growth pact" = Internal devaluation). In effect, he wants governments to change the rules so that it's easier to fire people, to take away their pensions, etc. On the fiscal problem, he wants governments to reduce their deficits through "good austerity", namely lower government spending and lower taxes. Together, these two initiatives form his Grand Plan, which appears to have been endorsed by Angela Merkel, to rescue the eurozone and put it on the path of sustainable growth again. I will briefly discuss the evidence for the view that a more expansionary monetary policy is needed. As already suggested, I do not deny that important structural problems, in the financial system and elsewhere, are helping to constrain Japanese growth. But I also believe that there is compelling evidence that the Japanese economy is also suffering today from an aggregate demand deficiency. If monetary policy could deliver increased nominal spending, some of the difficult structural problems that Japan faces would no longer seem so difficult. Q: [S]pecifically, could you address whether your current views are inconsistent with the views on that subject that you held as an academic? A: So there’s this view circulating that the views I expressed about 15 years ago on the Bank of Japan are somehow inconsistent with our current policies. That is absolutely incorrect. My views and our policies today are completely consistent with the views that I held at that time. I made two points at that time to the Bank of Japan. The first was that I believe that a determined central bank could and should work to eliminate deflation, that is, falling prices. The second point that I made was that when short-term interest rates hit zero, the tools of a central bank are no longer — are not exhausted. There are still other things that — that the central bank can do to create additional accommodation. In other words, do whatever you have to in order to avoid deflation. Lower interest rates. If rates are at zero, then go to quantitative easing and other additional tools to print money - all in the name of avoiding deflation. Today, both the US and Europe appear mired in a deflation trap. The Draghi solution is to prod member governments to become more Austrian - lower deficits through "good austerity" and structural reforms at the microeconomic level so that it's easier to do business and be competitive. The Bernanke solution is for the Fed to avoid deflation at all costs - ease and print money whenever its specter appears. By contrast, the current wave of anti-austerity movement in Europe seems to be embracing the Richard Koo solution to Japan's Lost Decades. Richard Koo, who is Nomura's chief economist, has said that monetary responses don't work because in a balance sheet recession, no one wants to borrow and therefore the economy will not grow. His prescription is extremely Keynesian. He calls for the government to spend until it hurts to stimulate aggregate demand - and then spend some more (see his recent presentation slides at an economic conference in Berlin). It will be years before we know whose approach wins out. The magazine cover buy signal? I have been seeing signs of a tactical trading bottom lately (see my posts last week here and here). Now we may have the magazine cover contrarian buy signal, based on the idea that when the mainstream press starts writing about a story, it's too late for investors to benefit from the trend. Most likely, a major news magazine cover trumpeting some trend is a sign that the trend is about to reverse (e.g. 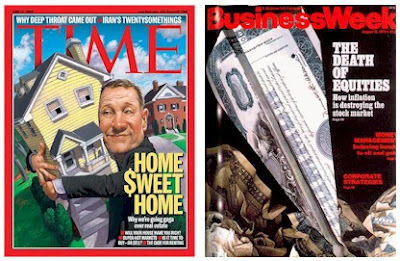 the famous Death of Equities cover story in 1979 or Time's Home Sweet Home cover in 2005). You don't even need to understand German to understand the gist of the cover. The Germans are resigned to the idea of a Greek exit from the euro. 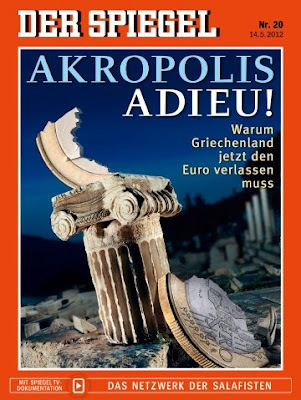 The English version of the story title is Grexit Would Be 'Regrettable, But Not Fatal'. My inner trader wants to buy risk in anticipation of an oversold rally. My inner investor tells me to watch the market action in likely ensuing rally to gauge the strength of the bulls as this is just another phase in the choppy up-and-down market action that we have been witnessing in the past few weeks. The market action on Thursday and Friday makes me more unconvinced that this is the start of either a sustained bull or bear move. We have a lot of macro cross-currents between now and year-end and navigating them will be a challenge for any investor. In some cases, we have economies that appear to be outperforming but likely to start to underperform later in the year. In other cases, you have the reverse - economies burdened with negative news but whose headlines are likely to improve later. The difficulty is that the timing of all these twists and turns will be highly uncertain. Moreover, it is unclear which headline the markets will focus on during this period of uncertainty. Europe: News flow and headlines are negative and likely to get more negative. However, investors shouldn't discount the effect of a political response, which would serve to kick the can down the road yet one more time and the markets would rally in relief. China: Uncertainty reigns, but the market perception of the likelihood of a hard landing is receding, at least for now. The change in leadership later this year is likely to usher in a period of stimulus, which would provide a bullish impetus to the markets. US: American equities remain the global leadership, for now, but economic momentum is faltering and the Fed may not have the political capital to act between now and the November elections. Moreover, the US faces a fiscal cliff in 2013. Markets typically look ahead six months or more. When does the markets start to discount the negative effects of that fiscal cliff? After the positive news about a "fiscal compact" and LTRO, which saved the eurozone from disaster late last year, the headlines from Europe is starting a negative cycle. The equity markets are reflecting that heightened anxiety as a glance at the DJ Euro STOXX 50 shows that it is in a well-defined downtrend. The bad news for investors is that the negative news isn't so bad that we are poised for a rebound. I would wait until the index declined into the support zone before nibbling away at positions. Across the English Channel, the FTSE 100 is declined and is now testing the 200-day moving average. I interpret this as another sign of market stress over the eurozone. This type of commentary ignores any policy reaction, and also often insults the leadership of European nations, the IMF, and the ECB. I suggest that investors read very critically when a story suggests causal relationships that lack specificity or quantification. Be even more suspicious when the story ignores policy responses. And finally, how about some quantification concerning Europe's impact on the US economy? My own conclusion -- familiar to regular readers -- is that the European story is an ongoing process of bargaining and compromise. US observers are far too ready to impose their own value judgments on other countries and cultures. The exact trade off of austerity, bank recapitalization, central bank intervention, and rescue funds is a work in progress. The exact nature will change and I still expect new entrants. 1. EMU itself is a culmination of two trends: 1) the integration of western Europe since the 1950s and 2) efforts to keep Germany wedded to the fortunes of Europe. The elite, and it is an elite project, knows no alternative strategy. 2. Because there is no Plan B, there is no mechanism to formally eject Greece or any other member. Polls indicate a majority of Greeks want to stay in EMU. 5. EMU is an institutional expression of the comity of Europe. These nation states have lived with each other for longer than the US has been around. It is very much like a family, even if dysfunctional (what family isn’t?). They did not get to chose each other. Their histories are intertwined. There is a great desire for peace and prosperity. It is difficult to prove that integration has made peace on the continent, but is sure looks that way. 6. The ECB’s Draghi and EC’s Rehn came out in favor of a growth/investment pact prior to this past weekend’s election results. This changed the political discussion. German officials recognize the shift and have sought to get ahead of the curve. Some suggest that this is always what was intended. Austerity was phase 1 and growth/investment was phase 2. The debate is now really over the content of a growth/investment pact, not whether one will be forthcoming. While European stocks are reflecting the anxiety about another eurozone crisis, the bond market isn't overly concerned. Consider, for example, the yield on the Italian 5-year note. Yields are below the crisis levels of last October and November and below the heightened anxiety levels of last summer, indicating that the bond market is not worried about contagion from Greece and Spain. The yield on 5-year Irish paper shows a similar picture. No anxiety at all. The yield on Spanish paper has risen, but they are at levels below the high anxiety days of last October and November. Trust the bond market over the stock market. The bond market has to finance the European sovereigns and their banks and signs of stress will show up there first. Don't extrapolate the effects of the dire headlines in a straight line. The bears should be aware of policy reactions. That's why I believe that while the headlines are headed south, they will reverse course in a few months and start to go north again. For investors, timing that turn will be a challenge. Moving eastward, there seems to be some degree of stabilization in China. The Shanghai Composite staged a brief but unconfirmed breakout from a wedge, which would be bullish. Although the latest trade figures were highly disappointing, the market reaction, which saw the Shanghai Composite close flat and marginally up on the day, was gratifying for the bulls. Next door in Hong Kong, the picture looks less bright. The Hang Seng Index has violated an important technical support level Friday. I would wait for signs of follow through before turning overly bearish, however. To understand China, you also have to understand the concept of how important "face" is to the Chinese. China's political leadership is scheduled for the change that occurs every 10 years late this year. The new leaders will loathe to step into a situation where the political and economic outlook are rapidly deteriorating - they will lose face. Expect a substantial stimulus package later this year to boost the economy. Already, the authorities are taking steps in that direction as the reserve requirement was cut by 0.50%. As with Europe, timing that turn will be a challenge. When will Americans realize they face a fiscal cliff? Moving the spotlight across the Pacific to America, US equities today remain the global leaders. The chart below of the SPX against ACWI (MSCI All-Country World Index) shows that US equities continue to outperform other global bourses. Not all is well in America. I wrote about the prospect of a short-term bounce last week here and here but the rally has been rather weak. JPM's problems notwithstanding, I believe that the rally will still materialize. The two things I will watch for in US equities are the ability of the SPX to hold support in the current support zone and for the index to rally above its 50-day moving average. 1. The Alternative Minimum Tax (AMT), currently at 28% for those filing jointly with incomes of $74K or greater, will drop down to $45K. That means that middle class families making over $45K will not be able to use deductions (medical, etc.) to pay less than 28% in taxes – a substantial tax increase on the middle class. 2. The so-called “doc fix” provision, which is currently keeping the government from implementing a 25% cut on physician payments by Medicare, will expire unless Congress acts. 3. The Payroll tax cut will expire at the end of 2012, increasing from 4.2% back to 6.2%. 4. The Super Committee’s inability to reach a decision last year will force mandatory cuts (sequester) in the US government’s discretionary spending. A great deal of that will hit the defense industry. 5. Unemployment benefits for workers who have exhausted the standard 26 weeks of benefits will be phased out. 6. Numerous temporary research and development tax benefits to corporations will expire. 7. The 2001 and 2003 tax cuts are set to expire. This includes tax rates on those making over $250K as well as qualified dividends and in particular the 15% rate on long term capital gains. People are wondering why we are having a string of large IPOs this year (including may private equity backed IPOs), even in a less than friendly IPO environment. Part of the reason is that the current cap gains tax rate may be the lowest that the owners will be paying in the foreseeable future. 8. At the end of the year the infamous debt limit will hit again, potentially forcing further cuts. According to Goldman Sachs, the total of amount of dollars the US government will be taking out of the economy is about $600 billion. Clearly some of these provisions may be modified or extended. But given the sharply divided Congress and the contentious election year, the political impasse is likely to continue. A large portion of these tax increases and austerity measures may take effect. These changes will potentially be a positive for the US budget deficit, but for an economy that is still fragile and somewhat dependent on government stimulus, it will certainly generate a material drag on the GDP growth. A 1-2% GDP contraction amounts to a run-of-the-mill recession. A 4% contraction puts the economy into economic depression territory. When does the stock market start to discount these risks? Can the Fed ride to the rescue? Moreover, high frequency economic data is going south, as exemplified by the last two disappointing NFP releases. Take a look at the Citigroup Economic Surprise Index, which charts the degree that economic data come in at above or below expectations. The index peaked in January and February and has been falling ever since and has fallen below the zero line, which is the level where economic releases come in at expectations. Moreover, ECRI has reiterated their recession call. If the economy is deteriorating. What about QE3? Don't forget that this is an election year. The Fed will hesitate to intervene unless there is unequivocal evidence that the economy is falling apart, e.g. the stock market craters by 20%. So don't count on the Fed to be proactive and ride to the rescue. Yes, the Bernanke Put still lives, but this insurance policy has a rather high deductible at the moment. In short, while the US market is still the leadership right now and global investors should give their US allocations the benefit of the doubt, the outlook will deteriorate into year-end. Timing that turn will be another challenge. So where does that leave us for the rest of 2012? In one word: Volatility. I wrote last week that I expected a short-term rally. This was a tactical trading call for a rally that was likely to last 2-4 days. Today, the relative performance of SPY (equities) against TLT (US long Treasury bonds) show that stocks have violated a relative support level against bonds, but look highly oversold. The relative performance of the defensively oriented Utilities sector against the market shows a similar bearish picture, but the sector appears to be extended on a short-term basis and ripe for a consolidation/pullback. When do some of these trends reverse and turn around? Given all these cross-currents, which headline will the financial markets focus on? These are the challenges we face. Be prepared for greater volatility and more choppiness in the markets. A bottom for gold and gold stocks?